← From Russia: The Russian Village and the Tornado! Recipe from Russia: Щи (Schi) – Veggy Soup with Sauerkraut! This soup is just absolutely delicious. Schi is one of the most traditional Russian soups. It is said to be dated before the adoption of Christianity in Russia. Well known for it’s sour taste mainly from sauerkraut, I have seen reference to it as beetless borscht! Cook for another 20 to 30 minutes with a lid on pot, to set the delicious flavor. 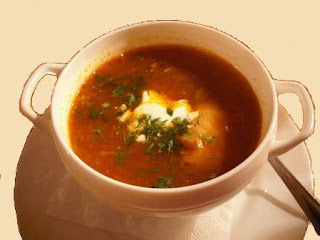 Now it is time to eat, do not forget to add a tablespoon of sour cream to the soup in your bowl!